RosterElf is a cloud-based employee roster management solution designed to make the processes simpler, faster, and more efficient. Easy to use and powerful, RosterElf lets users create rosters in the cloud effortlessly, make adjustments in a flash, and handle everything from staff availability, rostering, shift swaps, clock-in-out and payroll. RosterElf utilizes a beautiful sliding bar interface that enables users to instantly spot gaps and overlaps in their schedules and make the necessary adjustments to ensure whole coverage while operating within their budget limits. Users can easily adjust employee schedules and shifts to address business requirements, tasks, and budget. RosterElf will also meet their best financial interests, as it offers three separate plans that suit every user. RosterElf simplifies and speeds up the way you manage your people and your roster with a user-friendly interface that makes roster management, scheduling, shift swapping, and payroll all a breeze. With rostering easy and quick, RosterElf saves you and your company up to eight hours per week while you engage your employees better. WIth RosterElf, your employees are involved. You don’t need to chase or call your employees to see and confirm their availability. They can set and update their own schedule directly into the system. Employees can also submit requests for time offs and leaves while you can check their applications and decide to approve or decline them. 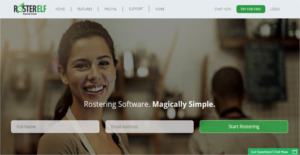 You never have to create multiple rosters from scratch as RosterElf allows you to copy rosters, re-use old roster templates, and enter employee schedule. The software uses a smart algorithm that automatically fills your shifts based on your employees’ information, availability, skills, and qualification. That means you don’t have to go through employee files to see who’s available and qualified for a specific task or project. RosterElf does the heavy work and leaves you with so much time that you can use to improve employee engagement, drive productivity, and increase output. What Problems Will RosterElf Solve? • Most casual work-force businesses are plagued with labor cost issues which can impact the profit margin significantly. • RosterElf saves customers an average of 3-4% in labor due to precise budgeting and elimination of time theft due to digital clock-in-out. • Clients tend to save about 3-5 hours a week in admin using RosterElf. • Payroll integration removes the need for manual data entry of awards for payroll. If you are interested in RosterElf it may also be sensible to analyze other subcategories of Best Employee Scheduling Software collected in our database of SaaS software reviews. It's essential to keep in mind that virtually no app in the Employee Scheduling Software category is a perfect solution able to meet all the needs of different company types, sizes and industries. It may be a good idea to read a few RosterElf reviews first as some solutions may perform well exclusively in a very narrow set of applications or be created with a very specific industry in mind. Others may operate with a goal of being easy and intuitive and consequently lack complicated elements welcomed by more experienced users. You can also come across services that focus on a large group of customers and give you a powerful feature set, but that frequently comes at a more significant price of such a software. Be certain that you're aware of your requirements so that you purchase a solution that provides exactly the functionalities you search for. How Much Does RosterElf Cost? We realize that when you make a decision to buy Employee Scheduling Software it’s important not only to see how experts evaluate it in their reviews, but also to find out if the real people and companies that buy it are actually satisfied with the product. That’s why we’ve created our behavior-based Customer Satisfaction Algorithm™ that gathers customer reviews, comments and RosterElf reviews across a wide range of social media sites. The data is then presented in an easy to digest form showing how many people had positive and negative experience with RosterElf. With that information at hand you should be equipped to make an informed buying decision that you won’t regret. What are RosterElf pricing details? What integrations are available for RosterElf? If you need more information about RosterElf or you simply have a question let us know what you need and we’ll forward your request directly to the vendor.